In a large saute pan, toast the pine nuts for a minute or two in a small amout of Olive Oil, remove and set aside. Add about 2 tablespoons of olive oil to the pan and add the garlic and diced onion to sweat. In the meantime, crush the San Marzano tomatoes. You can use a potato masher or your hands. Once the garlic and onions have wilted, add the tomatoes and simmer about 15 minutes. You want to retain the delicate sweetness of the tomatoes. You’re not looking for that “cooked” marinara flavor here. Think light and fresh. 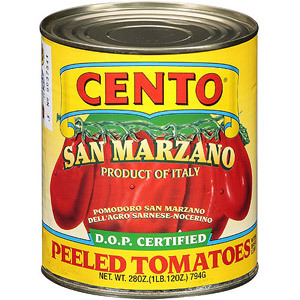 If it doesn’t say “San Marzano” it isn’t! Get the pasta going in a pot of salted water and cook until al dente. While this is cooking, drain the tuna from the oil, add to the saute pan and break up into pieces. Add the capers, the olives, and the reserved pine nuts. Once the pasta is done, combine, toss and serve. Garnish with basil. The key here is the tuna. Italian canned tuna is Yellowfin, which is superior in quality to all domestic tuna, which is Albacore. Bluefin tuna is the best, but a can of that will set you back about $10. The yellowfin below is about $2 per can on the Arthur Avenue market and I keep it in the pantry at all times. Here’s a picture of the Flott. Don’t be afraid of the oil! Water packed tuna is a myth. This tuna maintains the great taste of the sea without tasting fishy. Just be sure to drain it well or the pasta ends up greasy. Spaghetti is the perfect shape for this recipe too, because as the tuna breaks into tiny pieces, it clings to the pasta. Lastly, some crushed red pepper really brings this dish it’s authenticity. My guests® love this dish! The next time I make it – I promise to have a picture to post. Woefully deficient, I am. I can't believe people buy tuna packed in water. Ugh. Guess they think it's healthier or something? Whatever. I've been buying this brand called Tonno Genova for a while now for about a buck a can. Doesn't say where it's from, but I'm guessing it isn't from Italy. But it is wild yellowfin tuna in olive oil. Wine rec? I'm guessing something kind of fruity like a Barbera? I'll have to try your tuna/tomato sauce/olive spaghetti dish some time. Sounds quick, easy and tasty on a busy weeknight. Genova is good. I don't recall if it's from Italy or not. Pastene is another good brand. When you make this, resist the urge to add a second can of tuna. It looks like there's nothing in there when it breaks up, but 1 can is all you need for a pound of pasta. As for wine, drink what the locals drink! I'd go for a Sicilian Nero d'Avola but a Dolcetto, Barbera or even a Montepulciano d'Abruzzo would work I think.